Press Release:– A nineteen-strong swim team has been selected by the Saint Lucia Amateur Swimming Association (SLASA) to represent Saint Lucia at the XXIV Goodwill Swim Meet 2018 to be held at the Barbados Aquatic Centre, Wildey, St. Michael, Barbados from 17th – 19th August 2018. The Goodwill Swim Meet is a development swim meet, which means that the meet is designed to allow the less experienced swimmer who shows great potential, to compete as an individual at a level comparable to his or her own, in the hopes of generating the experience needed to be competitive at a time trial meet. 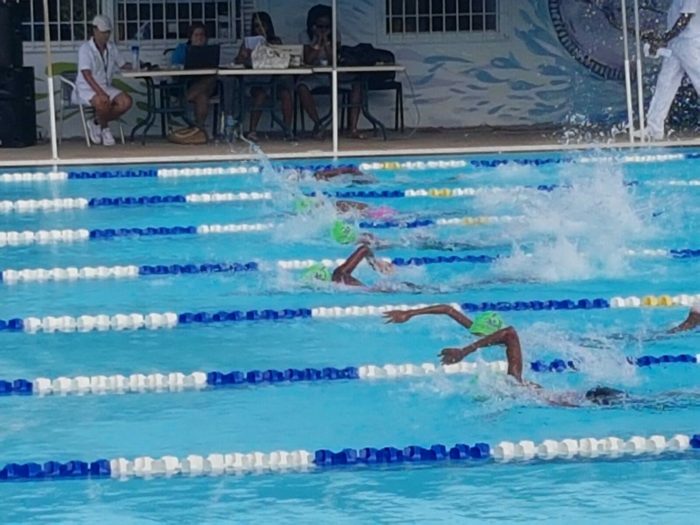 Carifta and CCCAN 2018 participants take a back seat at this competition allowing these swimmers an opportunity to earn their places on the podium. The team will compete against their peers from Jamaica, Barbados, Suriname, Guyana, Trinidad & Tobago, Bahamas and Grenada. The Team Manager Mrs. Cheryl Goddard-Dorville is confident that the team will perform well at the Meet and says: “While the strength of the swimming nations competing at the games is very high we are confident in the swimmers who have been selected and know that they are up to the challenge.” The team manager will be ably assisted by chaperones Mrs. Nickler Velinor-Paul and Mrs. Lisa Pultie. Head Coach David Peterkin and his Assistant Coach Henry Joseph will lead the teams pool preparations. The coaches have been working with the team at practice sessions which commenced on Tuesday 24th July 2018. The team trains 2 days weekly on Tuesdays from 5 p.m. to 6 p.m. and Sundays from 2 p.m. to 3 p. m. Thus far the team has had four training sessions and worked assiduously to improve their stroke and turn and overall technique in the pool. As part of the closing ceremony to mark the end of the Meet the team will participate in the cultural presentation aspect of the Meet where the teams show their peers that they possess talent beyond swimming. Saint Lucia’s presentation is always highly anticipated by the other participating nations at the Meet and this year will be no exception. The team intends to present a combination of song and dance which will showcase the work of our Saint Lucian soca artistes. Since the announcement of the team SLASA together with the swimmers and their parents held a beach barbecue/family fun day to assist the team in raising much needed finances to defray the cost of the trip. We are grateful to our many sponsors who gave generously at short notice to ensure the success of this event. We are also appreciative of all the business houses and individuals who have contributed gift items towards a raffle. We ask everyone to support our swimmers by participating in the raffle to assist our young swimmers secure more opportunities for overseas competition in the future.